Few songs have caught the tenor of the times the way “The Sound Of Silence” has. When Paul Simon wrote it in February of 1964, the wound to the American national psyche from the assassination of John F. Kennedy was still fresh and raw. While no one could have foreseen the turbulence of what remained of the 1960s, Paul Simon was able to invoke general present-tense alienation while peering into the future of America's most conflict-ridden decade since the Civil War. On a no-less-intriguing level, the "sound of silence" is one of the endless number of answers to a familiar Zen koan: what is the sound of one hand clapping? So, in some fashion, Simon's work is an attempt to write large a collective answer to a spiritual question. Rather than comfort, or a kind of uplifting, though, the song brings uncertainty and social and philosophical insecurity. The pair split after the failure, Simon going to England and Garfunkel back to college. Producer Tom Wilson had recorded Dylan for Columbia Records. As a sort of sandbox project he decided to overdub “The Sound Of Silence,” fortifying it, modernizing it to fit the swelling Folk-Rock movement. The new electrified version of “The Sound Of Silence” was released in September of 1965 and slowly clambered onto radio station playlists. Surprisingly, Wilson and Columbia Records didn’t bother to notify either Simon or Garfunkel. By the time they found out, Simon was performing solo in Copenhagen, Denmark, and hurried back to the U.S. just as “Silence” was entering the higher rungs of the pop charts. By January of 1966 it was number one on the charts. "Katherine Ross and Dustin Hoffman starred in the film, The Graduate. "The Sound Of Silence" was featured on the soundtrack. As the second verse begins, the Rock part of Folk-Rock kicks in. March-beat drumming lifts the song without changing the pace. The two lead guitars quietly duel underneath, around and through. A steady bass line seasons the whole stew, occasionally walking up and down the fret board. The dream motif continues, the narrator winding his way through empty streets where he is accosted by a neon sign, a symbol that will return at song’s end. There's no gaiety in the flashing lights; they're intrusive, dislocating. The listener is no longer in the good old U.S.A., but wandering a grotesque world of urban weight. Simon the writer is the inheritor of Kafka, Camus, and Joyce’s Stephen Dedalus. No one can pierce the invisible wall of silence. It is a silence of the doomed and damned, the lost, the forgotten. Simon insists on penetrating the impenetrable. He wants to reach out. He wants to teach. But he struggles against a dark tide. Meanwhile, the dubbed-in electric tracks swell, growing fuller and louder. There is a cacophony of guitars and drums that almost overpowers the vocals, although the precise mix-down stops just short of swamping the lyric. So powerful was the Folk Rock genre that we often overestimate both its number of practitioners and the length of time it was being produced. Aside from Simon & Garfunkel, Dylan, The Byrds, some Beatles and Rolling Stones songs, Buffalo Springfield, Neil Young and a handful of others, the roster is fairly short, though packed with superstar performers. The real Folk Rock years extend from roughly 1964 to 1968 before it broke down into constituent parts such as Country Folk, Folkabilly, Psychedelic Folk and other spin-offs. The influence of Folk Rock, especially that of its premier artists can hardly be quantified, so pervasive is its DNA in later music. When Dylan first plugged himself in, when Tom Wilson first plugged in Simon & Garfunkel, when Steve Stills and Buffalo Springfield created “For What It’s Worth,” they plugged in countless other acts. The Grateful Dead, Tom Waits, Van Morrison, Tom Petty And The Heartbreakers, even Led Zepplin through their following works all pay tribute to the pioneers. “The Sound Of Silence” is one of the most popular songs of all time. It speaks to the piece of the heart that eternally feels out of sorts and all alone. The threatening silence will always be present but there is a never-ending freight train of music to help keep that stealthy wolf from the door. 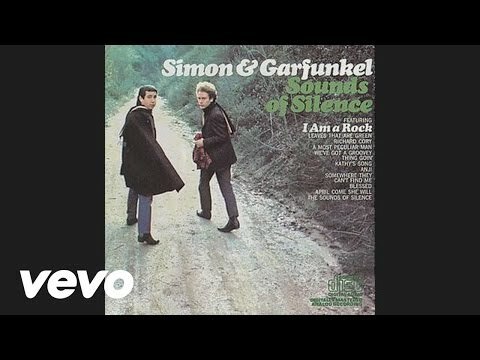 Originally the song was called “The Sounds Of Silence.” Simon, in his book-length definitive collection, Lyrics 1964-2008, uses “sound,” singular. A bare minute into the song, after the second verse ends, Young and Stills engage in a guitar duet that gives birth to Grunge.